If you add up all the aforementioned dishes and desserts you will have eaten roughly 3,060 calories. Now, I realise not many of you will consume an entire cup of gravy, but that's not including seconds or that turkey sandwich you'll have after everyone goes home. Yep. We all do it! So, do the math - with these seasonal sides chances are you are going to over eat unless you make a plan. annnnnd need I mention that your alcoholic beverages of choice can add hundreds of calories to that figure!? Now I'm feeling really nauseous. 1. Watch your portions. Have a bite or two of all your favorites but don't feel the need to pile your plate high! Think ahead to that overly stuffed feeling and work to avoid that. If you have to unbutton your trousers you've gone one step too far. Stop and reassess the situation. 2. Stay hydrated. Drink water throughout the day and continue to take small sips throughout the meal. Filling your belly with H2o will help you from overeating. and no, champagne, egg nog and beer do not count as appropriate hydration tools. 3. Don't skip meals. Keep things light, but don't restrict all day only to binge during dinner. Have breakfast, a small lunch and a snack before your main meal. That way you won't feel the need to over-indulge but simply enjoy a small tasting of all the goodies. 4. Be active. So you have plans to spend the afternoon and evening with your friends and family. GREAT! What about the other 14 hours of the day? Could you maybe squeeze a workout or a walk in there? This is not a real question. The answer is always yes. 5. Don't commit social sabotage. Once you've filled those bellies (appropriately, of course), move the conversation away from the food or at the very least, clear the dishes off the table. That way you won't be tempted with mindless noshing over the course of several hours of small talk, games and whatever else you fill your holiday with. Remember the reason for the season and leave the food in the kitchen. 6. Don't go home with leftovers. Unless it's turkey and brussel sprouts. Take those. Leave the rest. If you're the lucky one hosting this big event, GET RID OF IT. Clear the path. If it's in the fridge, guess what? You're more likely to eat it. 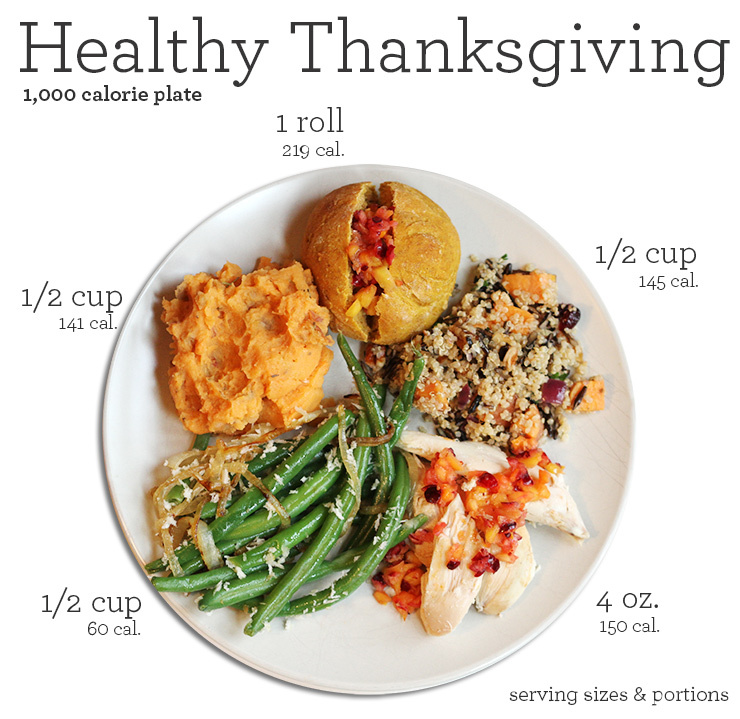 Eating a delicious higher-than-usual Thanksgiving meal is one thing…eating it every day for the next 7 days is another thing entirely. In fact, I think that's what they call holiday weight gain…or maybe it's falling off the wagon…either way! Have a very happy and healthy Thanksgiving! !